Project Detail Dashboard: new Messages window that shows associated Project emails that have been filed or are pending in the Inbox. 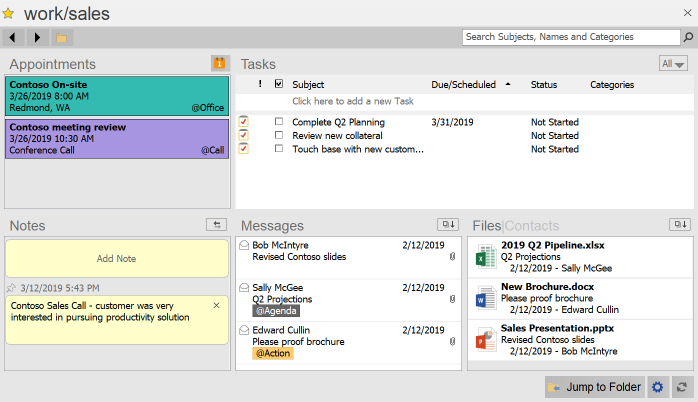 Category Colors: displayed category labels now show the Outlook color category coding in the Dashboard and Organizer. The update is being delivered now to users on the beta/early update channel, and is scheduled to go out to all users in the next few weeks. The build number in the About screen will show as 1901.00. 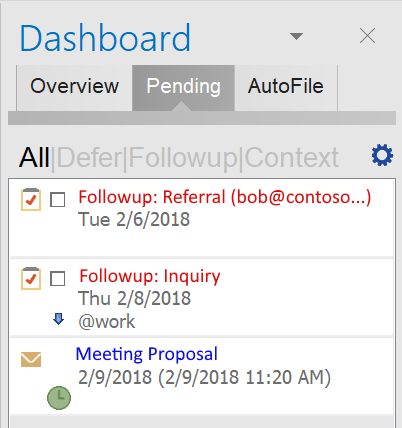 When the Delay Filing option is selected for a rule, the target Project is assigned and labeled to matching Inbox messages, but the message is not immediately filed. This option is useful for when you want messages categorized to a certain Project right as they arrive, but you want to file it yourself later. Just a quick note to announce the production release of the Pending Tab for the Dashboard. 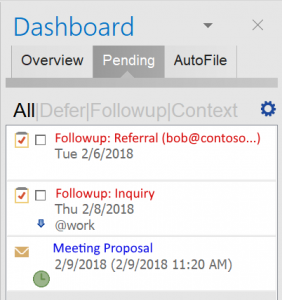 The new Pending functionality streamlines the main Dashboard task list to those are actionable and moves Followup and check later type to-dos to the Pending list. See full details in our previous notes here and here. The update is rolling out to Beta and Early Adopter channels now and will continue with all users shortly. We have decided to do one more quick beta update as a new capability has been added to the new Pending functionality. 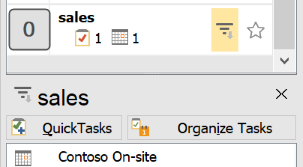 Tasks tagged with specific context categories can now be listed in the Pending tab and excluded from the regular Dashboard task list. By default, tasks with an @pending category will be managed in the Pending list. The context categories used for the Pending list can be customized by clicking on the gear icon in the Pending tab. Commonly used GTD categories such as @waiting or @someday may be ones that you want to define as Pending categories. Unless we encounter any unexpected difficulties, this beta version will be transitioning to production later this month. Posted by ClearContext at 8:42 am on March 9th, 2018. 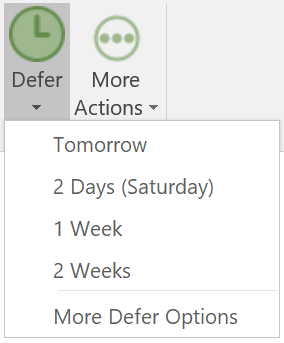 A new One-Click Defer capability has been added. When enabled, clicking the Defer button immediately defers the selected message for a pre-configured amount of time. 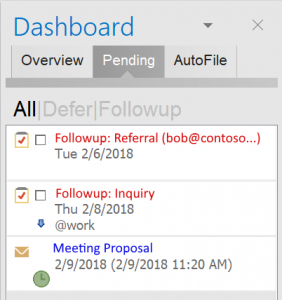 In addition, the button in the toolbar/ribbon is split into 2 sections – the One-Click Defer button and a down arrow that is used to access other Defer options. 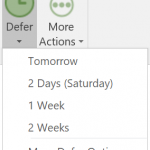 This option may be enabled by clicking on the Show Options button in the Defer window. Posted by ClearContext at 10:47 am on December 8th, 2017.